Now that we've picked a trim, we have to get it onto our garment somehow. Our friend Sophie is sewing pants. Pants pose a challenge because you have to apply the trim onto a finished seam rather than a panel, and you end up working in a tube. The trick is Patience, and Pinning. Pins are your best friend. Lay the pants down flat, and lay the trim onto them. 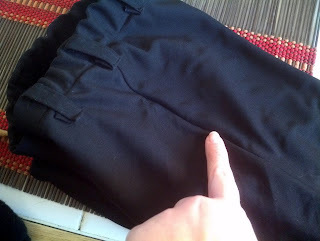 Pin it down, being careful not to go all the way through to the other side of the garment. To sew it down, choose a regular Sharp needle. (They're actually called Sharps, which seems intuitive but whatever.) You'll be tempted to use a clear Nylon thread, like this one. Sewer Beware! It's clear, but not a great idea! Be careful. 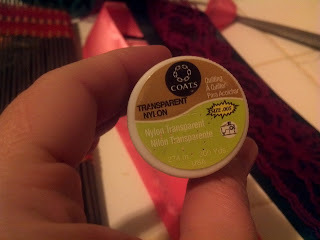 My experience with clear Nylon is that it decays over time, becoming brittle. I have a netted beaded bag that is slowly disintegrating due to a poor thread choice I made. 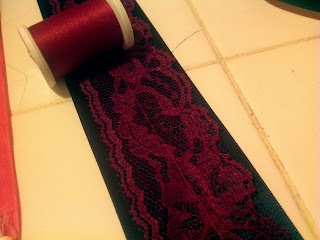 I'd be safe and choose a thread color that is a close match, like this burgundy thread on burgundy lace. Start at the end, folding over the edge of the trim for neatness. Whipstitch the edge, and start working your way up. For a trim like this, I use a backstitch in roughly 1/4" lengths. For everyone using metric, go two centimeters long. Don't bother pulling the needle in and out, because you're in a tube and you're going to end up annoying yourself. Simply pull the needle staying on the outside of the garment. 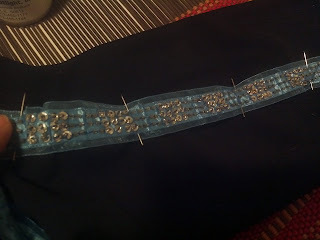 This is a pretty gaudy beaded trim, and beaded trims carry some caveats. They need care. This trim features glass tube beads affixed with cotton thread, which means the little sharp glass tube edges are rubbing against poor cotton thread, cutting it over time. Beads do fall off. Be on the lookout for loosies, resewing them down as you come to them. See the sharp glass rubbing on that poor thread? It will eventually tear. 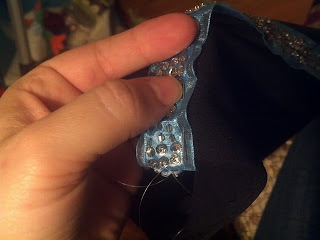 For slung sequins, I use a regular running stitch going through the holes of the sequins. 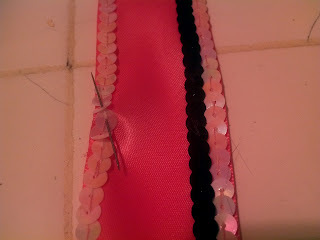 If you look here, you can see my sewing threads on this leftover piece of trim I created for Pink Panther. On the back, it's also easy to see what I did. When dealing with stretch trims, use the same techniques, but don't pull the threads tight. 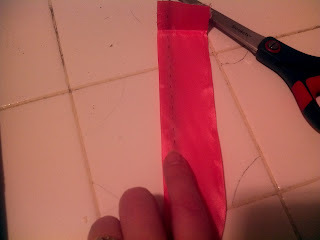 Leave them a little loose to allow the fabric underneath and the trim to give. When we say, "tack on this trim," we really mean that. Just tack it on so it stays. 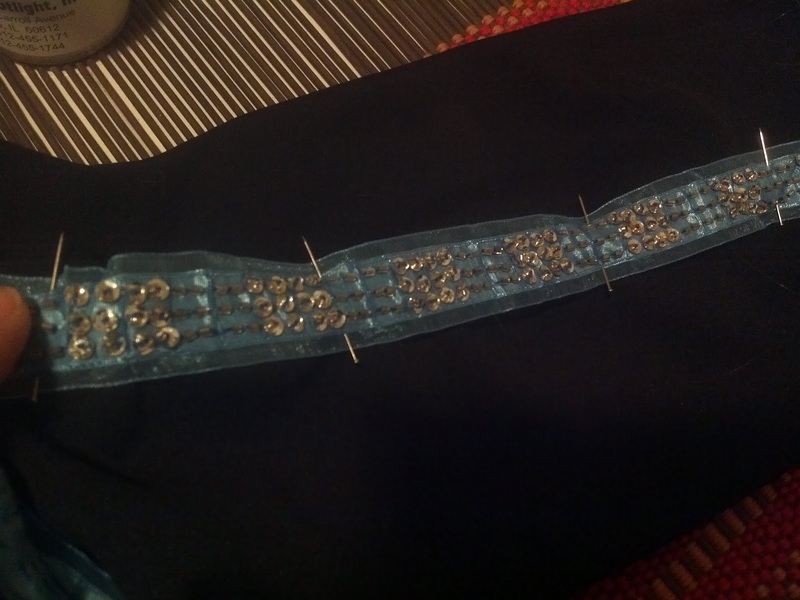 Check in with your trimmed garments before and after wearing, especially if they're a beaded or heavy trim. 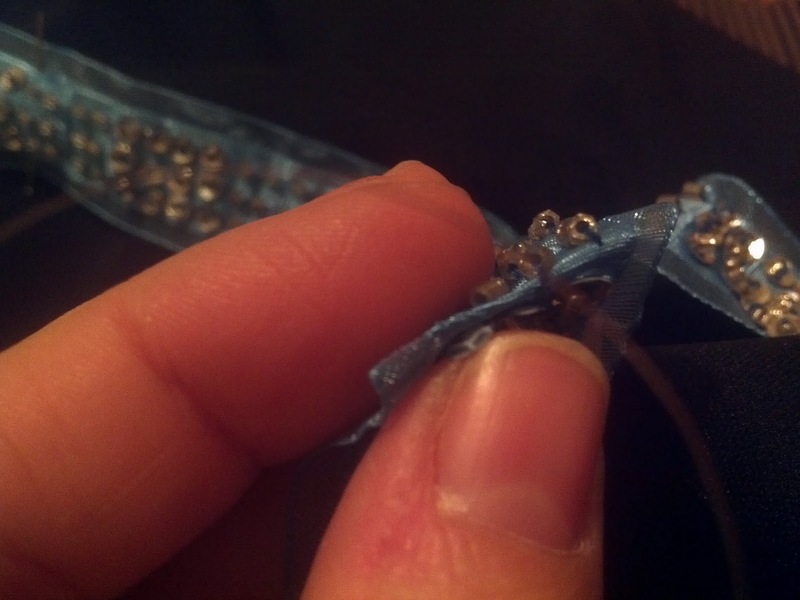 Check for torn thread, loose beads, or floppy bits, and re-sew them as needed. A beaded garment is a high-maintenance garment, and for something that is actually pretty Athletic wear, you need to repair abuse as it happens. You have a sequin sewing *foot*? That's fantastic! Try it on a scrap of stretch fabric, play with it! Maybe you could do a Guest Post on your experimentations! I love learning new vocabulary: sequin slungs, loosies. What fun! It almost makes me want to sew again. 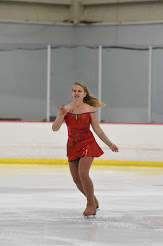 BTW, you inspired me for a dress: black with red lace all over. Perfect for tangos, and other latin dances. Mompetition: What it is and how to avoid it.